If the Eagles aren't confident enough in Nate Sudfeld backing up Carson Wentz, they'll probably consider bringing in someone like Teddy Bridgewater (above) or Tyrod Taylor. INDIANAPOLIS – The Eagles added another piece to their ever-expanding front office Monday, and while Howie Roseman said that Andrew Berry’s hiring wasn’t “a reflection of anyone and their particular roles,” it’s difficult to not view him at least as insurance should Joe Douglas leave in the next year. Berry was vice president of player personnel with the Browns – Douglas’ title with the Eagles – and his experience in the NFL has been primarily as a scout. But he’ll work under Roseman in football operations as a vice president and not under Douglas, who also reports to the Eagles’ senior executive, in scouting. What will Berry’s new job entail? “These jobs that you have, there’s a lot that goes on,” Roseman said Wednesday at the NFL combine. “Obviously, the most important thing is improving our roster and making sure we have the right players. He’ll be a part of that. But also looking at decision-making and every area of football ops. Howie Roseman has had his eye on Andrew Berry for a while. Berry played cornerback at Harvard and graduated with a bachelor’s degree in economics and a master’s in computer science. Roseman said the Eagles have had their eye on the 31-year-old for a long time. Berry spent six years with the Colts before moving to Cleveland, but he didn’t have his contract renewed when Browns general manager John Dorsey hired former Packers colleagues. Douglas will oversee his third draft with the Eagles since being hired in May 2016. The Texans requested to interview him for their GM vacancy a year ago, but the Eagles exercised their right to block a meeting. Only the Raiders changed GMs this offseason, but there could be nearly a dozen openings after next season. The jury is still out on Douglas’ drafts, but another playoff appearance could make him one of the more sought-after evaluators in a year. A contract extension for Carson Wentz, even though he’s available for one, is increasingly unlikely this offseason. Both the Eagles and the 26-year-old quarterback would have incentive for waiting a year. The team needs to see how Wentz recovers from the stress fracture in his back and whether he can finish a season for the first time in three years. He would conceivably want to increase his value, especially compared with classmate Jared Goff. While Roseman would have likely structured an extension to create enough salary cap space in 2019, a one-year reprieve does allow the Eagles to make short-term investments designed to help them get back to the Super Bowl. Roseman declined to give a timetable on Wentz’s return, but sources close to the quarterback said that he is expected to be healthy by the start of workouts in mid-April. Carson Wentz (center) and Doug Pederson celebrate Nate Sudfeld's first touchdown pass in December. In other words, the Eagles are more likely to bring in an established veteran than they are to expend a draft pick on a developmental prospect. 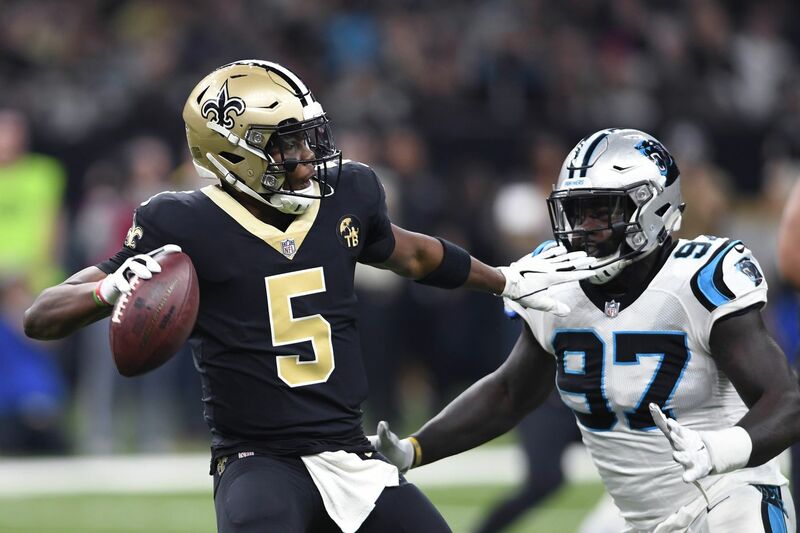 Keep an eye on former Bills and Browns quarterback Tyrod Taylor and former Vikings and Saints quarterback Teddy Bridgewater. Sudfeld is a restricted free agent and the Eagles have until March 13 to tender him a qualifying offer. A second-round offer should be enough to keep other teams from trying to match. The 25-year-old quarterback recently switched agents and is now represented by Rep 1 Sports, which also has Wentz as a client. Speaking of Foles, the Jaguars have already begun the legwork on signing the free agent, and barring some late reemergence from other teams, will ink him to a contract under market value for starting quarterbacks. » READ MORE: Who will back up Carson Wentz after Nick Foles signs elsewhere? Brandon Graham’s three-year, $40 million contract doesn’t close the door on fellow defensive ends Michael Bennett and Chris Long. In fact, considering their production in 2018 (9 and 6-1/2 sacks, 56 and 37 quarterback pressures, respectively) and their cap numbers for 2019 ($7.2 million and $5.6 million) it would seem a no-brainer to bring them back. But Graham’s return and his new deal could have an adverse effect on the psyche of both players. Both Bennett and Long performed better after Derek Barnett suffered a season-ending shoulder injury and they received more playing time, and both publicly pointed out that fact. The Eagles could find Bennett more snaps inside, but he was unhappy coming off the bench in the first month of the season, and Graham and Barnett will be penciled in as starters in 2019. He may ask for his release, but the Eagles have him under contract for two more years at $15.2 million – a steal even at the age of 34. Long has more leverage, if he wants to be released, because he has said that he would rather retire than play minimal snaps. He had arguably his best season in five years, but his value in the locker room can’t be overstated, especially regarding the temperamental Bennett. Jordan Hicks' value is seen as "robust," meaning the Eagles might have a hard time holding on to him. As much as the Eagles want to keep their core, homegrown players, there will be casualties. Jordan Hicks, on the surface, once looked like one of the free agents the Eagles had the best chance of retaining, but the 26-year-old’s market was viewed as robust by several league insiders. Players with dubious injury histories don’t often receive multiyear contracts, but Hicks has a proven track record as a three-down linebacker and can play multiple spots in 4-3 or 3-4 defensive fronts. Hicks wants the opportunity to play all three downs. He lost that job to Nigel Bradham after he missed several weeks with a calf strain. The Eagles increasingly used their dime personnel package and that meant that only one linebacker stayed on the field. A long-term deal may not have much in terms of guaranteed money, so Hicks could elect to sign a one-year, “show-me” contract, but the Eagles’ willingness to offer such an agreement could depend upon how much 2019 cap space they have for real money. » READ MORE: Could this be the year the Eagles finally invest in a running back? The only certainty about Nelson Agholor this coming season is that he won’t play at his current cap number ($9.387 million) for 2019. The Eagles picked up his fifth-year option last year, but all that does is give them time to either rework his contract or release the receiver. They could try to trade Agholor, but his salary would probably scare off teams. An extension more in line with his production and with what other comparable slot receivers earn seems the more likely scenario. The Eagles have already shown this offseason that they’re in the business of retaining their own draft pick -- see: Graham and center Jason Kelce -- especially ones who won’t slack off after getting paid. Pederson was reluctant to admit that the addition of Golden Tate affected Agholor after last season’s trade deadline, but he sang a different tune Wednesday. The Eagles are committed to bringing Jason Peters back for another go-around, but he may need to be open to a contract restructuring that doesn’t have as many guarantees as he’s become accustomed to having. He started in all 18 games last season, but he also missed time in 10 games with various injuries. Peters will be another year removed from an ACL injury, but he turned 37 in January and the Eagles need some assurances. It’s been suggested elsewhere that the Eagles may want to sign him to a “pay-as-you-go” contract that would be dependent upon weekly starts. Peters has historically had his way in negotiations with the team, but retirement may be his only leverage. It’s hard to conceive his wanting to pick up and start over with another team, even if there were suitors. Pederson mentioned Peters’ wanting to get healthy this offseason, and the Eagles have always been willing to let the probable future Hall of Fame tackle take care of business in Texas during voluntary offseason workouts. Rodney McLeod fires up his teammates in the tunnel ahead of the Eagles' playoff game in New Orleans. It could be argued that of all the injuries last season, Rodney McLeod’s season-ending knee injury was the most challenging to overcome. The Eagles were unlikely to bring him back at a $9.9 million cap number, but the fact that he agreed to take a significant pay cut (from $7.5 million to $4 million) and one less year so early into the offseason surprised some around the NFL. McLeod and Malcolm Jenkins give the Eagles one of the more accomplished safety duos in the league, but they still have a hole at the third spot with Corey Graham unlikely to return. Avonte Maddox could fill that role, or split time in the slot, especially with the late-season ascendance of cornerback Cre’Von LeBlanc. Whatever the title, the Eagles value versatility in the secondary and need safeties who can cover slot receivers, tight ends, and running backs; who can defend the post; and who can play in the box and help stop the run. There’s been speculation that the Eagles could expend a high draft pick on a cornerback, considering the unit’s pass-defense struggles last season, but they have selected corners in the second round (Sidney Jones), third round (Rasul Douglas), fourth round (Maddox), and seventh round (Jalen Mills) in the previous three drafts.